The moment you set foot in Jaipur, you will feel like everything has come straight out of the pages of some epic novel. Majestic buildings, tales of heroic battles, resplendent forts and palaces, and multi-faceted characters ? Rajasthan is one of the most colourful and flashiest states in all of India, and its capital Jaipur lives up to the same reputation as well. Jaipur is a vibrant amalgamation of the old and the new ? highly urbanized pockets and shopping areas have casually sprung up beside gleaming forts and palaces. Jaipur has long been one of the shiniest cultural jewels in the history of the Indian subcontinent, and the royal corridors of the famously named 'Pink City' offer up a plethora of adventures and activities that make for a memorable holiday experience. Jaipur is known for its forts and palaces, and the most famous fort in the vicinity is the Amber Fort. Also commonly known as the Amer Fort, this majestic building with its maze-like passages and serpentine staircases is a very popular tourist attraction. Overlooking the Maota Lake, the fort is big enough that it will take you at least two to three hours to explore it in detail, and you can also choose to avail of the audio guides to lead you through this fascinating building while explaining the history of the place. Getting an elephant ride up the stairs to the Amber Fort is also a popular tourist activity. City Palace is another top draw for anyone wishing to know more about the rich history and culture of the Pink City. Home to Rajasthani Maharajas back in the 1700s, this building has now been converted into a museum where tourists can learn about the history of the city in detail. City Palace comprises Mubarak Mahal and Chandra Mahal, with the Chandra Mahal being only partially open to visitors, as the rest of the building is used as the residential place of the Maharajas? descendants. Jaipur is more than just ancient glitz and glamour. It is home to Jantar Mantar, an astronomical observatory site that has been declared as a UNESCO World Heritage Site. Containing the world?s largest sundial and about 20 other fixed instruments used to make various astronomical observations, the Jantar Mantar is an exemplary example of how far architecture and science has progressed in India. You can avail of either audio guides or human guides to give you a tour of the entire place. Other famous attractions in Jaipur include the Hawa Mahal, the Nahargarh Fort, and the Jal Mahal, and, with the Nahargarh fort situated high in the Aravalli hills, and offering spectacular views of the entire city and its surrounding landscape. Jaipur is filled to the brim with bustling local bazaars where you can shop for local handicrafts and trinkets to your heart's? content. Popular bazaars in the city include Bapu Bazaar, Tripolia Bazaar and Johri Bazaar. The entire state of Rajasthan is renowned for its delicious cuisine, and Jaipur is no exception! The local cuisine of Jaipur is as mouth-watering as it?s buildings are gorgeous. Don?t forget to try traditional Rajasthani dishes such as Ghewar and Dal Baati Churma. The massive edifice of Hawa Mahal stands at the intersection of the main road in Jaipur, Badi Chaupad. It is regarded as the signature building of the city and was built by Maharaja Sawai Pratap Singh in the year 1799. Hawa Mahal derives its name from its unique structure, which is a mesh of small windows that allowed cool wind to enter the palace and hence kept the palace comfortable during the hot summer months. The main reason behind the palace's construction was to allow the women of the royal house to observe the festivities on the streets whilst being unseen from the outside. Hawa Mahal is built in the Rajput architectural style and is constructed of red and pink sandstone. The Palace has a pyramidal structure which almost resembles a crown, and is embellished with myriad tiny windows. From within, the Hawa Mahal palace is based on five floors with each and every one of them housing uniquely decorated chambers. A charming fountain welcomes you inside the main palace, from whereon you can make your way up to the different floors. The top of the palace offers a brilliant view of the City Palace, Jantar Mantar and the ever-busy Siredeori Bazar. There is a small museum as well which holds some rich relics and miniature paintings. Cradled on the top of the Aravali Hill and forming a beautiful reflection across the Maotha Lake, lies the Amber Fort. An architectural masterpiece and with significant reference in the Indian history, it is visited by over five thousand tourists daily. Only eleven kilometres away from the capital city of Jaipur, Amber Fort is clad in pink and yellow sandstone and is a part of an extensive complex. The Fort gives a mesmerizing view from the bottom of the hill when it is illuminated every evening. Built by one of the most trusted general of Akbar, Man Singh who had a huge impact on the Indian politics and society in the sixteenth century; Amber Fort or Amer Fort as it is locally referred is a photographer's paradise. The Amber Fort through its large ramparts and several gateways and paved path overlook the Maotha Lake. Amer is a small town with an area hardly over four square kilometres, it once served as a capital city of Rajasthan and is one of a prominent tourist attraction today with visitors coming from all over the globe. You have an option of visiting the fort on elephant-back which has drawn immense flak from animal rights activists with reports of animal abuse and injuries to the elephants from carrying tourists uphill. Amber Fort and Jaigarh Fort, both located atop the hill called 'Cheel ka Teela' were part of a single complex. They are also connected through an underground passage meant as an escape route during emergencies. Located in the Pink City of Jaipur is the Nahargarh Fort, which is one of the many countless palaces and beautiful historic buildings that speak of the magnificent and rich history of this city. Embellished with delicate carvings and stonework, the Nahargarh Fort is an impregnable fortification that together with its two neighbouring forts, Amer Fort and Jaigarh Fort, once stood as the strong defence of Jaipur city. Standing tall on Aravalli Hills, the Fort was built by Maharaja Sawai Jai Singh II in the year 1734 as a retreat. It was originally called Sudarshangarh Fort, but was later renamed to Nahargarh Fort which literally translated to "The Abode of Tigers". With some breathtaking views of the city, the Nahargarh Fort is known for its extended wall which connects it to Jaigarh Fort. One of the main attractions in the premises of the Nahargarh fort is the Madhavendra Bhavan, which is a magnificent hall designed with intricate murals and stucco work. Nahargarh Fort was primarily used a s a retreat f or the ladies of the royal household and has a ladies quarters by the name of 'Zenana'. Also known as the Madhavendra Bhavan, the 'Zenana' was built by Maharaja Sawai Jai Singh II. Its counterpart, the 'Mardana Mahal' was also constructed in the complex for the royal men. Another attraction in the Nahargarh Fort is the Nahargarh Biological Park, which is an asylum for majestic animals such as tigers, leopards and the Asiatic lions. Situated in the Ram Niwas Garden of Jaipur, the great Albert Hall is the oldest museum of Rajasthan. Standing as a perfect epitome of Indo-Saracenic architecture, the building is named after the Prince of Whales, Albert Edward. Also called as the Government Central Museum, it has an extensive collection of artefacts brought from the different regions of the world which makes it a hub of imparting knowledge on Indian history. The night tourism is even more exciting. The entire building glows with yellow lights in the evening which looks extremely beautiful. You can relax in the gardens with the stunning view of Albert Hall in the backdrop. Or gorge on the ice-creams and chaats from the thellas that are parked nearby. The Albert Hall is the right place to head when you feel like knowing about Indian history profoundly. Flanked by lush green gardens, the foundation of Albert Hall was laid on 6 February 1876 when Albert Edward visited India. The galleries of the museum have a collection of antiques and artefacts from the past that will blow away your mind. The ancient coins, marble art, pottery, carpets and especially the Egyptian mummy are a treat to the eyes of history buffs. The building itself from the outside has an alluring architecture. The Indo - Saracenic inspired domes and intricately carved arches constructed from sandstone is mesmerizing. Located on the outskirts of the regal city of Jaipur, Galtaji Temple is a prehistoric Hindu pilgrimage site. Outlined by the striking Aravalli hills, it consists of several shrines, holy kunds, pavilions and natural springs. This majestic temple is situated in the heart of a hilly terrain that is bounded by a beautiful gorge which attracts tourists here every year. Galtaji Temple was built using pink colour sandstone and is a vast temple complex housing varied shrines. Located inside the City Palace, the walls of this temple are beautifully adorned with carvings and paintings that make this place worth visiting. The Galtaji Temple is situated in the Aravalli hills and is bounded by thick plush trees and bushes. This remarkable building is decorated with painted walls, round roofs and pillars. Apart from the kunds, this pre-historic Hindu pilgrimage place also has temples of Lord Ram, Lord Krishna and Lord Hanuman within the temple. One of the main tourist destinations of Jaipur, the temple complex boasts of natural freshwater springs and seven holy 'kunds' or water tanks. Among these kunds, the 'Galta Kund', is the holiest one and is believed never to get dry. Pure and clear water flows from the 'Gaumukh', a rock shaped like a cow's head, into the tanks. This spectacular temple is designed to look more like a grand palace or 'haveli' than a traditional temple. The Galta Monkey Temple has a scenic and gorgeous landscape featuring rich green vegetation and has a spectacular sight of the Jaipur city. This temple is known for the many tribes of monkeys that are found here and the religious hymns and chants, along with the natural setting, offer a peaceful ambience to tourists. Jaigarh Fort is a grand structure perched on the top of the 'Cheel ka Teela' hills in the Pink City of Jaipur. This magnificent edifice was commissioned by Sawai Jai Singh II in the year 1726 to protect Amer Fort. Cradled on the top of the cliff it is a palatial structure bounded by verdant greenery and massive battlements. This magnificent fort is connected to Amer Fort through subterranean passages and is famously known as the "Fort of Victory" as it was never conquered. The fort currently houses the world's largest cannon on wheels and offers a magnificent view of the Jaipur city. Conceptualized and designed by a talented architect called Vidhyadhar, Jaigarh fort is said to be the strongest of all the three forts and never faced any major resistance and test-fired the world's largest cannon only once. The fort reflects the city's prosperous past and is named after the ruler who got it built, Sawai Jai Singh II. Built with an original purpose of protecting Amer Fort, the palace within the complex of Jaigarh fort is architecturally similar to the Amer Fort. Other than its elaborate architecture, the fort is also known for its huge treasure that was believed to be buried under it. It is said that the treasure, when discovered during the 1970s, was seized by the government of Rajasthan. In the outskirts of Jaipur, away from the mayhem of the city, lies the splendid and tranquil Jal Mahal. 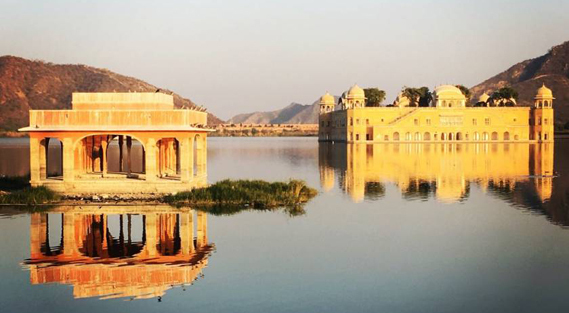 It is also called as the Water Palace because of its location in the middle of the Man Sagar Lake in Jaipur. This low rise symmetrical Palace was once a shooting lodge for the Maharajas and now fascinates many visitors from all over the world. It is one of the most beautiful architectural palaces built by combining the Mughal and Rajput style of architecture. The Jal Mahal nestled in the lake with verdant Nahargarh Hills in the backdrop looks mesmerizing. The entry inside the fort is prohibited, but the view from a considerable distance is enough to please your eyes. During the evenings, it is lightened up and the sight is overwhelming with its reflection in the lake.With its impressive beauty and laid-back ambience, the Jal Mahal has become the favourite stamping ground for Jaipurites. While you gorge on ice-cream and street food, a romantic stroll at the magnificent Palace will give the time of your life. A place which can calm down your disturbed mind and bring peace, it is the Water Palace. And, Jal Mahal is also the perfect place for that perfect selfie! Ram Niwas Garden is a royal garden built in 1868 by Maharaja Sawai Ram Singh in the capital of Rajasthan, Jaipur. The beautiful garden is located in the core of the city and is considered as a historical landmark in India. It occupies over 30 acres of land and is the location of the Albert Hall Museum or the Central Museum. Tourists visit Ram Niwas Garden from all over the world to experience the regal vibe of this historical landmark and get a glimpse of the lifestyle of the royalties during the British Era. One can explore the lush green landscaped gardens and or visit the theatre, the Bird Park, the Zoo or the Art Gallery. The location is apt as a picnic spot and locals frequently visit to rejuvenate with friends and family. The scenic Ram Niwas Bagh also has an exhibition ground reserved for exhibition purposes. There are ample facilities for picnickers as there are some spots meant only for them. There are several cafes located near the quaint garden that tourists can stop by to grab a bite or two of the local delicacies of Rajasthan. The bird park is a treat for bird watchers and nature lovers. Several birds flying together in a group is a mesmerising sight not just for the children but the grown-ups too. The beautifully landscaped garden also has some fountains that add freshness to the serene atmosphere. After sunset, the garden is lit with lamp posts that emit a warm glow and make it look even more fascinating. The magnificent Birla Mandir in Jaipur is a Hindu temple that forms a part of one of the several Birla mandirs located all around the country. Also known as the Lakshmi Narayan Temple, the shrine is situated on the Moti Dungari Hill from where the Lord looks over all his devotees. The temple was built in the year 1988 by the Birlas when the Maharaja of Jaipur gave the land away for a token amount of one rupee. Built purely out of white marble, the edifice of the Birla Temple is an amalgam of ancient Hindu architecture styles and modern design. The walls of the temple are embellished with intricate carvings of Gods and Goddesses and words of wisdom from the Puranas and Upanishads. The pictures of historical achievers, legends, philosophers and spiritual saints like Socrates, Christ, Buddha, Confucius are also displayed in the temple. Do visit the Birla Temple during Janmashtami, as the temple is abuzz with activity during this time. As the name suggests, Laxmi Narayan Temple is dedicated to Lord Vishnu (Narayan), the preserver and his wife Lakshmi, the Goddess of wealth. The commemorated deity of Laxmi Narayan gets a special attention since it is carved out from a single piece of stone. Besides all other idols, the idol of Ganesha is a magnum opus that appears almost-transparent. The walls of the temple bear illustrations of important events and revelations that have been mentioned in Hindu sacred texts, which add to the aura of serenity in the temple. The gentle chanting of the holy mantras, the diffused fragrance of incense sticks and the occasional ringing of the temple bells will certainly transport you into your own version of higher consciousness. Visit Birla Temple for a rendezvous with the Divine. Chand Baori is a major tourist attraction site inÔ_Abhaneri villageÔ_that belongs to 10th century monuments of Rajasthani architectural expertise and talents. It is a very big step well with flights of steps on the three sides that lead to the water reserve. This well is a unique invention of Abhaneri_ã_s people and is a treat to the eyes for native and foreign tourist as it is a huge well with convoluted and delicate engravings. Chand Baori is amongst the most unique step wells in India. It is believed to have been established during the 8th - 9th centuries AD under the patronage of King Raja Chand, a Nikhumba Rajput who ruled the area. The big tanks are utilized as cool places of resort and to conserve water in reservoirs for the scorching summer days. In addition to conserving water the Chand Baori is a community gathering place for the Abhaneri local people. Some say it served religious purposes because of the two carved niches containing rock-cut images of Goddess Durga and Lord Ganesha. Regardless of its purpose, beauty of Chand Baori cannot be described and the interesting thing about Chand Baori step well is that it has 13 stories deep with thousands of steps designed with perfection up and down each levels. It is built with 3,500+ symmetrically laid out steps in a perfect square plan. The step well show the craftsmanship of early medieval or post Gupta period. Pink City in Jaipur refers to the old walled city that was built in the year 1727 by Maharaja Jai Singh II. The wall that marks the boundary of the Pink City is about six metres high and three metres thick and encompasses a number of structures within its confines. In keeping with the magnificence of the structure, there are seven different gates that provide access to the Old City, namely Chand Pol, Suraj Pol, Ajmeri Gate, New Gate, Sanganeri Gate, Ghat Gate, Samrat Gate and Zorawar Singh Gate. Built about 275 years ago, today it presents the glorious past of our country through its culture and architecture. Steeped with rich past and heritage, the Pink City of Jaipur is a place of royal heritage, culture and architecture. The city is covered in the tint of pink colour oozing charm and attracting tourists from all over the world. The place offers a feast to its visitors in the form of its historical saga with magnificent palaces and forts and stunning Havelis. A number of important structures such as Badi Chaupar, Jantar Mantar and City Palace are situated in this part of the city. The vibrant bazaars of Jaipur like Bapu Bazaar and Johri Bazaar are paradise for shopping lovers offering beautiful Rajasthani jewellery, fabric, shoes and handicrafts. Bustling with colours, a walk around this old city gives you a glance into is the wealth of handicrafts, the royal legacy of the palace, and a shadow of their rich past. The magnificent City Palace is one of the most famous tourist attractions in the city of Jaipur, Rajasthan. Built by Maharaja Sawai Jai Singh during the years 1729 to 1732, the vast complex of the palace occupied one seventh of the walled city. The imposing complex of the palace used to be the seat of the Maharaja of Jaipur. Planned with precise intricacies, the palace was divided into a series of courtyards, buildings and gardens including the Chandra Mahal and the Mubarak Mahal along with various other palaces. The Chandra Mahal is now a museum but the major part of it is still the royal residence. The museum showcases various unique handcrafted products and other things that belong to the royal heritage of the City Palace. It is a structure of historical importance and a souvenir of the brave past. The architecture of the City Palace will strike a sense of awe in you from the very beginning. The facade itself is designed with acute and detailed handiwork and showcases a gentle blend of Mughal and Rajput architecture styles. The outer wall was built by Jai Singh II, but the palace itself has been subjected to various changes over the course of time, with some of them even belonging to the early 20th century. The City Palace has three gates, out of which the Virendra Pol and Udai Pol are open to the public. The striking courtyards, lush green gardens and splendid edifices will transport you to the era of the Regals for sure! Located near the City Palace in the regal city of Jaipur, Jantar Mantar is the largest stone astronomical observatory in the world. This ancient study boasts of nineteen instruments built out of stone and brass and was built by Raja Sawai Jai Singh in 1727-33. The intelligent construction and placement of these instruments allowed the observer to note the position of heavenly bodies with their naked eye alone. Time has failed to lay dust upon this engineering marvel and it still works as well as it used in the olden times. An amalgam of various disciplines, Jantar Mantar stands proudly as a witness of the wisdom and mathematical prowess of a former age. Owing to its rich cultural, heritage and scientific value, Jantar Mantar has also been featured on UNESCO's list of World Heritage Sites. The main objective of building this vast observatory was to study and gather information about space and time as was known. The instruments here pertain to Egypt's Ptolemaic astronomy and follows three classical celestial coordinates to track the positions of heavenly bodies- namely horizon-zenith local system, the equatorial system and the ecliptic system. This observatory also employs the "Kapala Yantraprakara", which allows the transformation of one coordinate system to the other directly. Another fact that makes this destination unique is that the world's largest sundial is situated here. The observatory in Jaipur is a part of a collection of five other such observatories built by Raja Jai Singh, which are located in New Delhi, Ujjain, Varanasi and Mathura. The architectural brilliance of Jantar Mantar is an amazing thing to experience and is a delightful look into the days bygone. For Krishna followers, this is the most significant temple in the world after Vrindavan. It is believed that the statue of the deity here looks exactly like Krishna's form during his incarnation of Earth. It is located in the same campus as City Palace. Also, it is best to visit this temple around Janmashtmi when an exotic and joyful celebration takes place. Chokhi Dhani is a luxury heritage resort synonymous with Rajasthani village culture. It is located a little on the outskirts of the city on the Tonk Road. The concept of the village is to give you a tangible feel of rural Rajasthan. It is a real depiction of traditional Rajasthan with ancient artefacts, handicrafts, paintings, folklore and sculptures. "Chokhi Dhani is a miniature model version of an ethnic Rajasthani village equipped with all modern- day amenities to provide its guests with the best of both worlds- a peek into the ethnic, cultural past with the luxuries of the modern world. The village offers myriad entertainment options- folk dances, singing, camel rides, puppet shows, fortune-tellers, acrobatics, predicting parrots, magic shows, horse riding, boating etc. In addition to that, it has an art gallery, mouth-watering food, shopping arcade and royal accommodation. Everything from the construction to décor to culture to food and hospitality gives you the feel of being in a traditional village. It was established in 1989 and has been serving local and international tourists since 1994. Managed under the Chairmanship of Mr Gul Vaswani and Director Mr Subhash Vaswani, Chokhi Dhani is a reflection of Rajasthani ethnicity and indigenous mores. It has machaans & different platforms for performing artists. It also holds mini village fairs occasionally. Alongside, it is also a 5-star luxury hotel with Royal Cottages, Cottage Rooms and Haveli Suits for tourists to choose from, based on their needs. The guest rooms all, have the facilities of ACs, refrigerators, flat screen TVs, mini-bars, internet access and in-room dining. The resort has a royal décor with ancient relics, vintage furnishings and gives the luxurious look and feel of olden day Rajasthan. The Moti Dungri Temple is one of the famous temples in Jaipur. Dedicated to Ganesh, this early eighteenth century shrine attracts devotees and tourists from all over the world. The temple is placed on a hill and is surrounded by a palace. The palace, called Moti Dungri Palace, is modelled after a Scottish castle. However, it is now closed to the public. The Moti Dungri Temple is open for public from 5:00 AM to 1:30 PM and 4:30 PM to 9:30 PM on all days of the week. The best time to visit the shrine would be during the months of November to March. The other tourist attractions in Jaipur include the Hawa Mahal, Statue Circle, The City Palace and the Nahargarh Fort. Also worth a visit are some other attractions like Abhaneri, Bagru, Bairath, Karauli, Ranthambore National Park, Ramgarh Lake, Sambhar, Samode, Sanganer, Sariska National Park, Tonk and Jantar Mantar. The temple is easily accessible from all parts of Jaipur. The Ganesh Chathurthi and Paush Bada are the best occasions to visit the temple if you want to have a glimpse of Indian culture and heritage. Besides the plethora of palaces and forts and havelis and wildlife, Jaipur is also the ultimate shopping paradise. Among the numerous flourishing flea markets of Jaipur is the Bapu Bazaar. Situated in the heart of the Pink city between Sanganer Gate and New Gate, the market is known for its alluring Rajasthani quintessential products including textiles, handicrafts, brass works and precious stones. The bazaar attracts tourists from all over India and worldwide owing to its authenticity, diversity and giveaway price products. "The bazaar not only gives you a cultural charm and feel of the state but also offers stunning ethnic souvenirs to take back for your kith and kin. The vivacious market bustling with shopaholics at all times is mostly famous for Mojari- the footwear made from the skin of camel. Amongst the myriad shopping options available are traditional Rajasthani lehenga- cholis, Bandhej salwar suits, sculptures and figurines in marble and sandalwood, hand-crafted home décor gifts and paintings, conventional block printed bedspreads, cushion covers, fabrics and a lot more. Chand Pol or the Moon Gate is one of the famous architectural structures built according to the traditional Vastu ideology. The Moon Gate is located in the old Jaipur city near the main market road. Naubat Khana is the uppermost section of Chand Pol, where drum players and other musicians used to sit. It also used to serve as a gathering place for commoners, for making important announcements. The three entry gates in this wall have been located in western, northern and eastern directions. Anokhi Museum of Hand Printing is a charitable foundation that works with an objective of preserving the traditional customs and works of artisans living in Jaipur. This foundation provides employment opportunities to several artisans by nurturing their talent and skills. It also aims at reviving the age old tradition of hand block printing, with a special focus on the traditional hand printing methods and techniques. This museum is situated in the ancient 'Chanwar Palkiwalon ki Haveli' (Anokhi Haveli) which is pink in colour. The trust also organises live demonstrations of the hand block printing craft, done by the local artisans. Furthermore, there is a cafe and a shop inside the museum that sell handmade products like jewellery, cards, books, furnishings and clothes. Swaminarayan Mandir Akshardham Temple is one of the well-known tourist attractions of Jaipur. The temple is known for its beautiful architecture, magnificent idols, sculptures, and carvings. and is dedicated to the Hindu God, Narayana aka Lord Vishnu. Akshardham temple provides the real glimpse of Indian architecture, cultural heritage and sculptures of Hindu gods to the visitors. Akshardham Temple in Jaipur has not such legendary history since it is a modern temple which was built recently in between 19th and 20th century. But it still depicts the architectural wonders of Indian temples and is one of the most visited temples in Jaipur city. Dedicated to The Vedic Supreme God, Lord Narayana, the temple is located in Vaishali Nagar and is visited by millions of devotee all round the year. The idol and the temple buildings offers a place fo serenity and peace. The temple is surrounded by lush green gardens and fountains. Its unique architecture is what attracts most of the tourists here. The walls of the temple are beautifully decorated with number of paintings, sculptures and carvings which adds beauty to this place. The main idol of the temple which is of Lord Vishnu is decorated with the gold and silver ornaments. Akshardham Temple is an ideal visiting place that is situated away from the city and but will bring you closer to the nature. The stunning architecture and beauty of the temple make the visitors surprised and stunned. Discover the extraordinary Chand Baori stepwell of Abhaneri near Jaipur built by King Chand in 9th Century. Chand Baori stepwell has nearly 3,500 narrow steps and is 13 stories deep. It goes approximately 30 mts. into the ground making it one of the deepest and largest stepwells in India. Visit the Harshat Mata Temple, built by King Chand that lies close to the stepwell. This temple also belongs to same period when Chand Baori stepwell was constructed. Panna Meena Ka Kund is a step well located on Jaipur-Amer road. Built in the sixteenth century, this place has criss-cross steps arranged on three sides with small niches created into the walls. The fourth side has a multi-storeyed balcony. This eight storey step well remains cool during the hot summer afternoons and was probably used for the purpose of community gatherings. Visitors can climb down the steps to reach the bottom of the kund. The kund has many doorways on all sides. This architectural wonder is made in such a way that the same stairs cannot be used to climb up and down. Once you are done with trying this out, you can sit in one of the niches and take in the beauty of this step well. The water from Panna Meena Ka Kund must have been also used for irrigation and drinking purposes. Ramps have been built to ensure drinking facilities for cattle. Currently the water is not potable. One can also visit Amber Fort and Amber Palace. Anokhi Museum is at a walking distance from this step well. Panna Meena ka Kund is a good place for photo shoots. Amrapali Museum is a unique jewellery museum housing a collection of contemporary and exotic jewellery collected over four decades established by the famous Jaipur-based Amrapali Jewellers. The museum also has silver antiques and exquisite showpieces made in gold or silver and is a must visit spot for jewellery lovers. The garden was built in 18th century by Maharaja Sawai Jai Singh for his second queen Sisodia Rani, Udaipur princess. This garden was used by the queen for relaxing. The garden was decorated with mural painting of Lord Krishna and Radha to express the love that the king had for Sisodia Rani. The garden was specifically built outside the city to keep it away from the hustles and noises of local life. The garden is designed with a mixture of Indian style and Mughal architectural style. The spires and pavilions of the garden are designed in the Indian style. The wall paintings and decorations are also a form of Indian style. The flowerbed arrangement, water channels and fountains are designed in Mughal style. There is a small shrine and a natural spring near the garden that are dedicated to Hindu Gods; Lord Shiva, Lord Hanuman and Lord Vishnu. The garden overlooks the grand palace of the queen, which is filled with mural painting of hunting scenes, scenes from the story of Lord Krishna and so on. The palace is open for tourists to explore. Built in the heart of Jaipur, Central Park is the largest park in the city. It boasts of housing the tallest Indian National flag in the premises. Other than the beautiful lush green surroundings, the park also has Rambagh Polo ground and golf club nearby. Besides, it has a jogging track, musical fountains, a temple etc. It is also used for bird watching. Located on the Delhi bypass in Jaipur at Lakshman Dungri, Khole Ke Hanuman Ji Temple is a Hindu revered temple dedicated to Lord Hanuman. The temple is perched on a hillock and offers some panoramic views of the surrounding hills. Besides, the shrine has a spacious sanctum which can accommodate around 500 people at once. Kanak Vrindavan is a beautiful garden developed in the Aravalli Valley at the base of Nahargarh Hills. The garden has notable similarities to Vrindavan valleys and hence the name. It also has a temple enshrined by Lord Krishna, water fountains and exquisite marble carvings besides the verdant green lawns. It also lies close to Amer Fort and Jaigarh Fort. Sargasuli Tower or Isar Lat is a historical heritage monument situated near Tripolia Gate of City Palace in Jaipur. The seven tiered minaret is built in a fashion similar to that of Qutub Minar in Delhi and Kirti Stambh of Chittorgarh. The tower has a tiny entry with a spiralling staircase and every tier has a balcony outlet. Raj Mandir Cinema is an olden days movie theatre situated on the Bhagwan Das Road in Jaipur. The building has been shaped to look like a meringue and has become a popular mark in the city. Opened in 1976, the theatre still premieres movies. Located near K. K. Royal Hotel in Amer, Jaipur, Elefantastic is one of a kind elephant farm in all of the country. The elephants farm houses 23 female and 1 male elephant. Besides offering insight and information about the majestic mammal, the farm also facilitates elephant safaris. Besides, it also has camping facilities for guests who want to stay. Jawahar Circle is situated in Malviya Nagar in Jaipur and boasts of being the largest circular park in Asia. The park has a peculiar jogging track and is encircled by a rose garden. Besides, it has play area for kids and kiosks. The main highlight of the park is the dance of the musical fountains which is one of the most popular tourist attractions of the city.